Vertical banded gastroplasty is a surgical procedure in which a small pouch of stomach is created with the help of bands and staples. The vertical banded gastroplasty is also known as stomach stapling. This surgery is performed to control weight and it a type of bariatric surgery. Vertical banded gastroplasty is performed very less due to some restrictions. 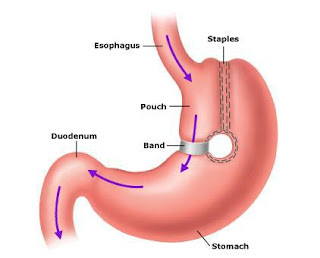 In this surgical procedure a pouch is formed with band and staples and the lower end of pouch is kept open like a hole to drain the stomach items into the remaining stomach and Gastro Intestinal tract slowing the passage of food. The disruption in the line of staples can occur because of bilateral flow of food items. Another condition fibrosis in stomach can occur i.e. the connective tissues in stomach wall get thicker and a scar can occur. A disease can occur secondary to vertical banded gastroplasty VBG named gastro esophageal reflux disease. Last but not least associated complication of vertical banded gastroplasty VBG is the incisional ventral hernia. Vertical banded gastroplasty have many advantages and one of the advantages is it can control the amount of food items and in turn control the obesity and weight. Dumping syndrome do not occur i.e. the stomach do not get empty rapidly and due to the surgical band placed the food items pass slowly as a result controlling weight. Another advantage is that there will be no loss or deficiency of nutrition or malabsorption because the slow passage of food disable the loss of nutrition and protect from malabsorption. The patient have to stick to the diet plan strictly. The patient feel difficulty in digesting fibrous food because of slow passage of food in stomach. So the patient started taking junk food instead of healthy food and as a result the patient start gaining weight again. Along with vertical banded gastroplasty the patient have to stick to diet and exercise strictly. Due to surgery, there may be scarring or other complication and for this a reversal is required which is more complicated. The patient having vertical banded gastroplasty also have to stick to diet plan and exercises. The patient is recommended with vitamin supplements for the nutritional gain. The patient have to follow diet plan for long term. Right after surgery, the patient have to start with liquid intake and then follows with some mashed food. After 2 to 3 days of surgery, the patient start having semi solid food and even a few teaspoons can make the patient feel full. The healthy and fibrous food in low quantity is recommended in diet plan.